Heraldic emblems used throughout history have been used to distinguish one family from another, or between countries. This royal crest tapestry 'Crest And Fleur' consists of 3 fleurs de lis, which are elements of French and German coat of arms and royal crests. In this crest, there are also elements of scrolling acanthus leaves, armor, swords, shields and Roman rulers. Made with Chenille and with sepia overtones, this tapestry reflects on the importance of heraldic tapestries used since the Middle Ages in royal families and were even rewards of victories in war as tapestries exchanged hands and became the property of their new owners. The iconic symbols in this royal crest are a delight to behold. 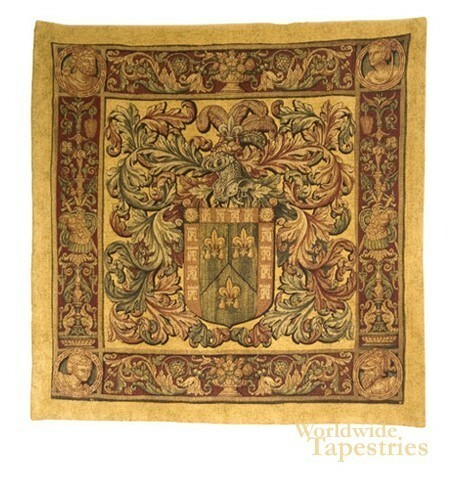 This coat of arms tapestry is backed with lining and has a tunnel for easy hanging.